Protonix Common Uses: Protonix (Pantoprazole) is a proton pump inhibitor (PPI) used to treat ulcers, gastroesophageal reflux disease (GERD), erosive esophagitis, or Zollinger-Ellison syndrome. Protonix (Pantoprazole) works by blocking acid production in the stomach. Protonix (Pantoprazole) may be used in combination with antibiotics including amoxicillin or clarithromycin to treat certain types of ulcers. Protonix (Pantoprazole) may also be used to treat other conditions as determined by your doctor. How to use Protonix: Follow the directions for using Protonix (Pantoprazole) provided by your doctor. SWALLOW WHOLE. Do not break, crush, or chew before swallowing. Protonix (Pantoprazole) may be taken with antacids if your doctor has instructed you to take antacids. Do not miss any doses of Protonix (Pantoprazole). STORE Protonix (Pantoprazole) at room temperature, away from heat and light. FOR BEST RESULTS, continue taking Protonix (Pantoprazole) for the full course of treatment even if you feel better in a few days. IF YOU MISS A DOSE OF Protonix (Pantoprazole), take it as soon as possible. If it is almost time for your next dose, skip the missed dose and go back to your regular dosing schedule. Do NOT take 2 doses of Protonix (Pantoprazole) at once. 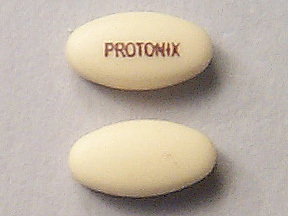 Protonix Side Effects: Protonix SIDE EFFECTS, that may go away during treatment, include headache, dizziness, diarrhea, or nausea. If they continue or are bothersome, check with your doctor. CONTACT YOUR DOCTOR IMMEDIATELY if you experience swelling of hands, face, lips, eyes, throat, or tongue; difficulty swallowing or breathing; hoarseness; or rash. If you notice other effects not listed above, contact your doctor, nurse, or pharmacist.